Over 5000 years ago the Incas cultivated the grain-like seed quinoa as one of their staple crops. Now science has shown that this humble “grain” is actually a superfood! 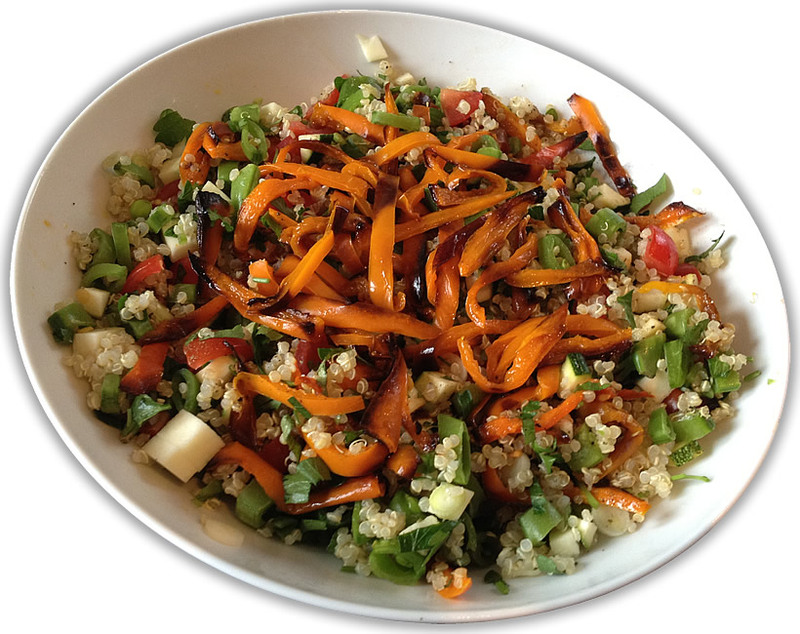 Quinoa is full of phytonutrients, antioxidants AND can even help balance your blood sugar. As a result, people everywhere are discovering the benefits of quinoa, a delicious whole “grain” that is easy to digest, full of high quality protein and fibre, and can form the basis for delicious meals. Quinoa (pronounced keen-wah) is not a grain; it is actually a seed and related to the spinach family. When cooked, quinoa is light, fluffy, slightly crunchy and subtly flavored. It actually cooks and tastes like a grain, making it an excellent replacement for grains that are difficult to digest or feed candida (a systemic fungal infection). Studies have shown that quinoa has documented health benefits too! Researchers attribute the health benefits of quinoa to its complete nutritional makeup. Quinoa is close to one of the most complete foods in nature because it contains amino acids, enzymes, vitamins and minerals, fiber, antioxidants, and phytonutrients. Quinoa is an ideal food staple because it does not feed fungal and bacterial infections in your body. The easiest way to enjoy the benefits of quinoa on a busy schedule is too cook up a big pot of it and use it for several different meals over the week. Cooked quinoa will keep well for 5 days if covered and refrigerated. Quinoa can also be bought ready-cooked in handy packets if you are super busy. It costs more this way, but it can be a useful store cupboard standby. Be sure to rinse your quinoa really well – quinoa, like every grain, has a coating of natural pesticide and rinsing helps to remove this. Ideally, rinse and then soak for at least an hour before cooking to remove the most of this natural substance and maximize the nutrient availability. If you soak your quinoa it will take less cooking time. The general rule for liquid twice the amount of liquid to grain: 1 cup of quinoa requires approx. 2 cups of liquid. This may need reducing for soaked grain. Experiment until you get it the way you want it! Use as a healthier substitute for rice with curry, chilli, etc. Stir in some chopped fresh herbs such as parsley or coriander for extra health benefits and flavor. Qinoa makes a great substitute for fried rice dishes. My favourite is shitake mushrooms, ginger,garlic, a pinch of chilli flakes and soy/tamari sauce. Add your favourite ingredients to create a delicious salad. Ideal for packed lunches and picnics. Assemble the night before for convenience. You can really get creative with ingredients, adding any leftover meat and roasted vegetables. This example was made with sliced fresh sugar snap peas, spring onions, courgettes, parsley and sliced roasted sweet peppers. Also consider sautéed mushrooms and even strips of cooked pancetta. 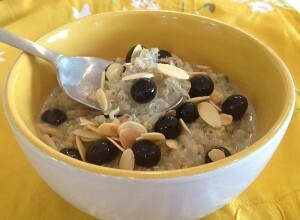 Make a delicious porridge with cooked quinoa soaked overnight in milk or almond milk. You can make it fresh in the morning if you forget to prepare the night before. Sweeten with coconut blossom granules, agave syrup, honey, natural stevia, maple syrup or sugar. This example was soaked overnight in almond milk with whole chia seeds added which ‘plump up’ overnight and add extra nutrients and keep you full for longer. A pear was grated into the mixture in the morning and finished off with fresh blueberries & toasted almond flakes. 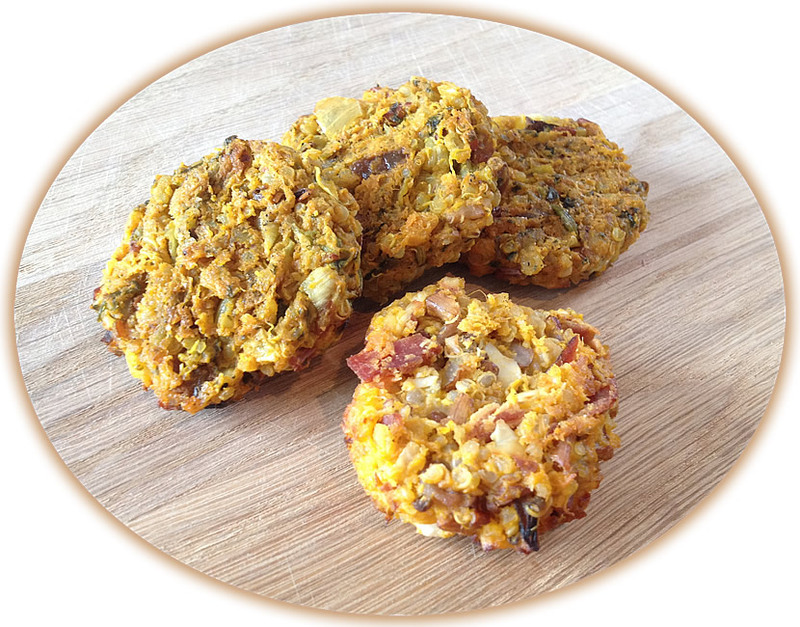 A great way to use up the last of your quinoa is to combine with ingredients and make little patties. Ideal for quick, healthy, protein-filled snacks, packed lunches and picnics. One of my favourites is curried quinoa patties. Bake a whole sweet potato, scoop out flesh & mash with fork. Shape into small patties and place on a grease proof paper lined baking tray. Bake in a medium temp oven for 15 minutes or until slightly browned. You can make these with whatever flavour combinations you like. Even breakfast patties made with bacon bits and finely chopped boiled eggs!